(1) Possible new species based on distinct larvae from western Mexico (Contreras-Ramos & Harris 1998). 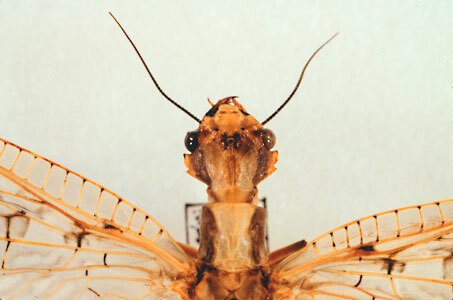 The dobsonfly genus Platyneuromus Weele is represented by a small, geographically restricted, and morphologically distinct group. Adults have a bizarre appearance given by the presence of postocular flanges, which are plates posterior to the eyes that may develop disproportionately in larger males. The growth of these plates has been shown to be analogous to the allometric pattern of the mandibles in many species of Corydalus. Platyneuromus is biogeographically interesting because it occurs only in Mexico and Central America, and because it is the most phylogenetically basal genus of New World dobsonflies. Its splitting from the Chloronia + Corydalus pair may date back to when its present distribution area was continuous with the present area of the most basal Chloronia and Corydalus species, that is southeastern Brazil. That ancestral vicariance event might date back to 120 million yr B.P., approximately the time when South America became separated from Africa and North America (Smith and Briden 1977). As in most dobsonflies, adults are attracted to lights and may be rather common in some localities. Larvae are typical hellgrammites, quite similar in general appearance to those of Corydalus, and probably perform a similar ecological role as predators. A list of Platyneuromus species with information on their distribution is available here. Adult Platyneuromus are easily identified by the distinct postocular flanges present on their heads. These plates, just posterior to the eyes are variable in development, in proportion to the size of the specimen. Also, males bear larger flanges than females, so there should be some caution especially in smaller examples in order to not oversee this diagnostic trait. Males and females have short mandibles with discrete dentition, that is, they are monomorphic in mandible shape, although as explained above, there is some sexual dimorphism due to the relative size of the postocular flanges. Forewing length of males ranges from 26–59 mm, and as in Corydalus, intraspecific variation in size may be misleading, however male genitalic characters are distinct for each of the species. Body color is brownish, sometimes with vittae on head and pronotum. Wings are clear to semitranslucent, somewhat patterned with darker areas. Platyneuromus soror (Hagen), male, Nuevo León, Mexico. Photograph copyright © 1989 Atilano Contreras-Ramos. 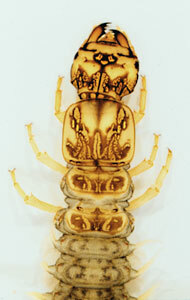 Only larvae of Platyneuromus soror (Hagen), the most widespread species, are known. Associated larvae are mostly from the Sierra Madre Oriental in Nuevo León state, northeastern Mexico, and further associations with adults would help to define intra and interspecific variation. Larvae of P. soror have head and pronotum patterned, as in Corydalus, however macrosetae of abdominal terga are clear and mostly smooth (dark and striated in Corydalus), also narrowly tubular (typically inflated in Corydalus). Larvae of Chloronia are unpatterned. Moreover, ventrally, larvae of P. soror have their submental projections sharply pointed with their tips extending beyond the anterior margin of the sclerotized plates of the submentum (blunt, tips not reaching anterior margin of submental plates in Corydalus). 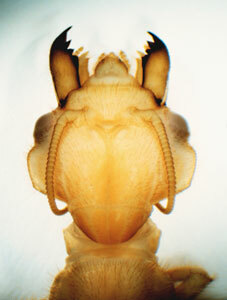 Pupae of Platyneuromus are easily distinguished because they already have noticeable postocular flanges, which are a diagnostic character for the genus. Platyneuromus soror (Hagen). Left: Larva. Right: Male Pupa. Nuevo León, Mexico. Photographs copyright © 1989, 1991 Atilano Contreras-Ramos. Much of what has been said for other Neotropical dobsonflies holds for Platyneuromus. Large gaps of formal information about life history characteristics of Platyneuromus species still remain, such as voltinism, food habits of larvae, adult behavior, etc. Two species of Platyneuromus have rather limited distribution in Chiapas (Mexico) and adjacent areas, and so it would be appropriate to asses their conservation status. P. soror, occurs from northeastern Mexico south into southern Mexico and Central America, reaching Panama. A comparative population study on genetic variation might yield interesting information regarding this poorly known insect group. There are, however, life history notes about P. soror from northeastern Mexico (Contreras-Ramos 1999). Adults captured with black light or obtained from prepupae were allowed to mate in an enclosure (a large glass terrarium illuminated with red light, with a moss bed, sticks, and water in a small container). Adults became active at dusk and males displayed a characteristic behavior. They walked around pursuing females, with their abdomen held above the substrate and its tip (10th tergites) held upright above the level of the wings. The latter were fluttered at intervals, constantly. When males encountered each other they did not fight, but remained facing each other in threatening position with their mandibles open for a few seconds. Males were very persistent in attempting to copulate, holding female’s abdomen with their 10th tergites. After mating, males softly bit female’s wings. No spermatophore was observed. However, quite likely further detailed observations will reveal the presence of a gelatinous spermatophore as has been observed in Oriental Protohermes (Hayashi 1992). Adult Platyneuromus were observed to drink a sweet solution in captivity. Life span was 3–7 days in captivity but it might be longer in nature. Platyneuromus hellgrammites have been observed to occur in similar habitats as the common and widespread Corydalus, for instance, in riffles under rocks, leaf packs, or walking on submerged vegetation at night. In northeastern Mexico, there appears to be an altitudinal segregation between Platyneuromus and Corydalus. At low elevations (about 500 m), under a semiarid climate, only Corydalus luteus Hagen is found, sometimes in intermittent streams with no current. At mid elevations (about 750 m), within forested vegetation, both C. luteus and P. soror co-occur, but higher up (ca. 1400 m), only P. soror is nearly always collected. It is unknown whether both species overlap in their use of resources where they co-occur. There is no formal hypothesis of phylogenetic relationships between Platyneuromus species. At this point, and simply based on similarity of morphology, it may be speculated that P. soror (Hagen) and P. reflexus Glorioso and Flint might be sister species, with P. honduranus Navás in the basal position sister to the former two. Long and convergent 10th sternite lobes, as well as short and arcuate 9th gonostyli are shared by the P. soror + P. reflexus pair. On the other hand, P. honduranus has short and divergent 10th sternite lobes, as well as long and unguiform 9th gonostyli. Platyneuromus was erected by Weele in 1909 for the species Corydalis [sic] soror described by Hagen in 1861. The genus was revised by Glorioso and Flint (1984), and currently it includes three valid species. It is unlikely that any new species of Platyneuromus will be discovered. However, until records of adults confirm their identity, the distinctness of larvae of Platyneuromus species A from Guerrero and Sinaloa states indicates that a fourth species may exist. The immature stages of the genus were described by Contreras-Ramos and Harris (1998). Contreras-Ramos, A. 1999. Mating behavior of Platyneuromus (Megaloptera: Corydalidae), with life history notes on dobsonflies from Mexico and Costa Rica. Ent. News 110: 125-135. Contreras-Ramos, A., and S. C. Harris. 1998. The immature stages of Platyneuromus (Corydalidae), with a key to the general of larval Megaloptera of Mexico. J. N. Am. Benthol. Soc. 17: 489-517. Glorioso, M. J., and O. S. Flint, Jr. 1984. A review of the genus Platyneuromus (Insecta: Neuroptera: Corydalidae). Proc. Biol. Soc. Wash. 97: 601-614. Smith, A. G., and J. C. Briden. 1977. Mesozoic and Cenozoic paleocontinental maps. Cambridge University Press, Cambridge, MA. Page: Tree of Life Platyneuromus. Authored by Atilano Contreras-Ramos. The TEXT of this page is licensed under the Creative Commons Attribution-NonCommercial License - Version 3.0. Note that images and other media featured on this page are each governed by their own license, and they may or may not be available for reuse. Click on an image or a media link to access the media data window, which provides the relevant licensing information. For the general terms and conditions of ToL material reuse and redistribution, please see the Tree of Life Copyright Policies.